SAN DIEGO -- Tony Gwynn, the Hall of Famer with a sweet left-handed swing who spent his entire 20-year career with the Padres and was one of the game's greatest hitters, died of cancer Monday. He was 54. Gwynn, a craftsman at the plate and winner of eight batting titles, was nicknamed "Mr. Padre" and was one of the most beloved athletes in San Diego. He attributed his oral cancer to years of chewing tobacco. He had been on a medical leave since late March from his job as baseball coach at San Diego State, his alma mater. He died at a hospital in suburban Poway, agent John Boggs said. "He was in a tough battle and the thing I can critique is he's definitely in a better place," Boggs told The Associated Press. "He suffered a lot. He battled. That's probably the best way I can describe his fight against this illness he had, and he was courageous until the end." In a rarity in pro sports, Gwynn played his whole career with the Padres, choosing to stay rather than leaving for bigger paychecks elsewhere. His terrific hand-eye coordination made him one of the game's greatest contact hitters. He had 3,141 hits, a career .338 average and won eight NL batting titles. He excelled at hitting singles the other way, through the "5.5 hole" between third base and shortstop. CBSSports.com notes that in 10,232 career plate appearances, Gwynn only struck out 434 times. Gwynn's wife, Alicia, and other family members were at his side when he died, Boggs said. Gwynn's son, Tony Jr., was in Philadelphia, where he plays for the Phillies. "Today I lost my Dad, my best friend and my mentor," Gwynn Jr. tweeted. "I'm gonna miss u so much pops. I'm gonna do everything in my power to continue to ... Make u proud!" Gwynn had two operations for cancer in his right cheek between August 2010 and February 2012. The second surgery was complicated, with surgeons removing a facial nerve because it was intertwined with a tumor inside his right cheek. They grafted a nerve from Gwynn's neck to help him eventually regain facial movement. Gwynn had said he believed the cancer was from chewing tobacco. Gwynn had been in and out of the hospital and had spent time in a rehab facility, Boggs said. 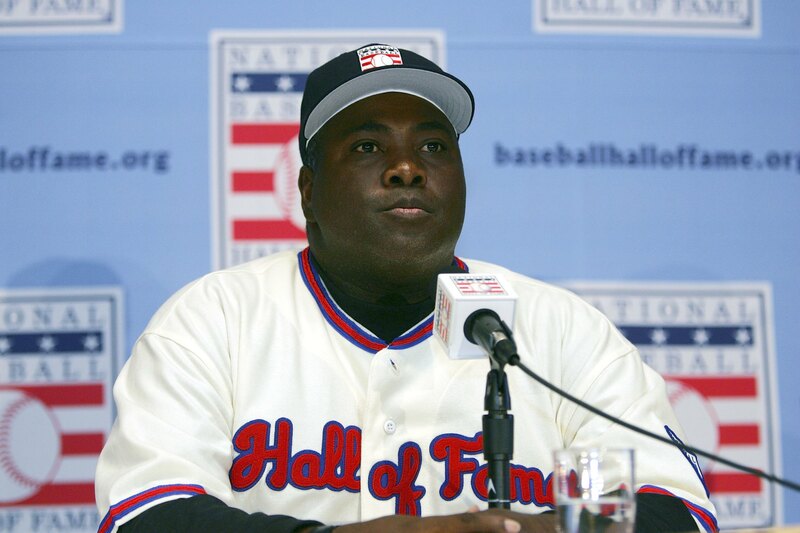 "For more than 30 years, Tony Gwynn was a source of universal goodwill in the national pastime, and he will be deeply missed by the many people he touched," Commissioner Bud Selig said. Said CBSSports.com baseball insider Jon Heyman: "Tony Gwynn will be recalled for being as fine a person as he was a hitter, and that says something for a man who won as many or more batting titles than anyone except Ty Cobb." Gwynn was last with his San Diego State team on March 25 before beginning a leave of absence. His Aztecs rallied around a Gwynn bobblehead doll they would set near the bat rack during games, winning the Mountain West Conference tournament and advancing to the NCAA regionals. Last week, SDSU announced it was extending Gwynn's contract one season. San Francisco Giants third base coach Tim Flannery, who played with Gwynn and then coached him with the Padres, said he'll "remember the cackle to his laugh. He was always laughing, always talking, always happy." "The baseball world is going to miss one of the greats, and the world itself is going to miss one of the great men of mankind," Flannery said. "He cared so much for other people. He had a work ethic unlike anybody else, and had a childlike demeanor of playing the game just because he loved it so much." Gwynn played in the Padres' only two World Series and was a 15-time All-Star. He homered off the facade at Yankee Stadium off San Diego native David Wells in Game 1 of the 1998 World Series and scored the winning run in the 1994 All-Star Game. He was hitting .394 when a players' strike ended the 1994 season, denying him a shot at becoming the first player to hit .400 since San Diego native Ted Williams hit .406 in 1941. Gwynn befriended Williams and the two loved to talk about hitting. Gwynn steadied Williams when he threw out the ceremonial first pitch before the 1999 All-Star Game at Boston's Fenway Park. Gwynn retired after the 2001 season. He and Cal Ripken Jr. - who spent his entire career with the Baltimore Orioles - were inducted into the Hall of Fame in the class of 2007. A wreath was being placed around his plaque in the Hall of Fame on Monday. Also in 2007, the Padres unveiled a bronze statue of Gwynn on a grassy hill just beyond the outfield wall at Petco Park. While Gwynn was still with the Padres, then-owner John Moores donated $4 million to San Diego State for a new baseball stadium that bears the Hall of Famer's name. Gwynn was a two-sport star at San Diego State in the late 1970s and early 1980s, playing point guard for the basketball team - he still holds the game, season and career record for assists - and outfielder for the baseball team. Gwynn always wanted to play in the NBA, until realizing during his final year at San Diego State that baseball would be the ticket to the pros. "I had no idea that all the things in my career were going to happen," he said shortly before being inducted into the Hall of Fame. "I sure didn't see it. I just know the good Lord blessed me with ability, blessed me with good eyesight and a good pair of hands, and then I worked at the rest." He was a third-round draft pick of the Padres in 1981. After spending parts of just two seasons in the minor leagues, he made his big league debut on July 19, 1982. Gwynn had two hits that night, including a double, against the Philadelphia Phillies. After doubling, Pete Rose, who had been trailing the play, said to Gwynn: "Hey, kid, what are you trying to do, catch me in one night?" Gwynn also is survived by a daughter, Anisha.